We cordially invite you to join us and the artist Urszula Tarasiewiczto celebrate the opening of her solo show Ogrodowa/Garden Street The exhibition is hosted by the hotel andel’s Cracow by Vienna House and Warimpex Finanz- und Beteiligungs AG, as a part of the project ANDEL’S PHOTO. Everyone in Łódź knows this story. Wealthy entrepreneur Izrael Poznański, in order to ensure a steady supply of labor force to his factory, decides to build a housing estate for workers on its grounds. This is how famuły in Łódź and Silesian familioki were developed. Indeed many more of such estates were built in those times. They played an important role in the development of industry and generally shared the fate of the factories that belonged to their founders: when their heyday had passed, the function of the buildings got changed. That’s exactly what happened with the subject of this exhibition, the housing estate at Ogrodowa street. Izrael Poznański (1833-1900) is regarded as being one of the icons of Łódź. His monumental factory just across Ogrodowa street (at the intersection with Zachodnia street) along with the laborers’ tenement houses, is a true city within a city. In its best years nearly 7000 people in total worked and lived here. The moment Poznański’s empire fell was the beginning of the estate’s and all of its inhabitants’ long agony. Its fate was concluded with the decommission of the Poltex company in 1991. Famuły became a no man’s land, its residents left to their own devices. This could have gone on forever if it hadn’t been for the project Mia100 Kamienic, thanks to which a major renovation of the Poznański’s factory housing estate started in 2014. The renovation was preceded by a long process of relocating all the residents. 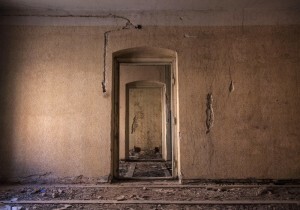 It was during this time that Tarasiewicz began to document the empty flats. The artist herself admits, “I’ve always wanted to be the guy who comes to read the meter – that’s a great way to peek into how people live. This has fascinated me since childhood, because the way a flat is decorated says a lot about its residents – whether they fill their walls with great grandparents’ wedding pics or a calendar full of naked ladies. Here the task was more difficult, because all this had to be imagined against the abandoned walls”. That’s indeed the case. 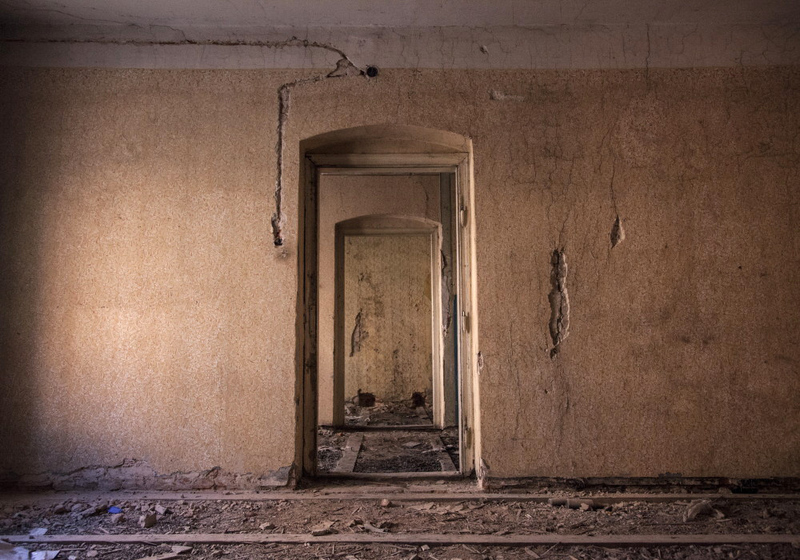 Looking at Tarasiewicz’s photos, we’re confronted with desolate rooms, dilapidated walls out of which someone ripped off electrical wiring and where time imprinted the ghosts of furniture and lost artworks. Such images feel quite familiar to us. This is what we’re always confronted with after a flood or some other catastrophic event. The crucial difference lies elsewhere: as far as in these cases such photos document the traces of the destructive forces of nature, in Tarasiewicz’s works everything is man-made. The greater the power of these photographs is. In Urszula Tarasiewicz’s photos famuły rooms stun with their ruthlessness, their coldness. At the same time they won’t let you forget about them, lingering in memory for a long time, and we cannot help but think about the visibly absent inhabitants. Viewing the photos, we also cannot help but think, how anyone could reduce his home to such a state? Who were the people who used to live here? Where are they now? How have their lives turned out after they left the flats often inhabited by their families for many generations? The photo wallpapers in those tiny flats, an attempt to escape from the surrounding reality, what do they symbolize? The artist guides us around the world which is already gone, lost. She does this in a leisurely manner, as if to give us time to reach the conclusion that this is the natural course of things. For the city is made of unique tissue that must evolve constantly. It was conceived of as such, this is its essence. If it’s stopped at some point – then it is doomed. Only a revolution could resurrect it. Just next door, round the corner, on the other side of the street the revolution has already been made: the Poznański factory was revitalized and turned into the andel’s Hotel. Factory spaces have been brought back to life, attracting people again, but this time the sort of people who would seem out of this world to the former residents of famuły. This must have been a real civilization shock for them, yet another proof of their exclusion. Tarasiewicz’s photos are just simple film frames. Here you could look in vain for the play with the composition, an attempt to construct interesting shots. This is not their goal anyway. They were not conceived of as source of entertainment, or to make us feel good. We should instead perceive under our own skin the feeling of hopelessness which must have accompanied the residents of these spaces every day. Confronted with these images, one feels the roughness of this place as it’s becoming a thing of the past. Thanks to these photographs however, its recollection has a chance to be saved. Urszula Tarasiewicz /b. 1975/ studied Photography at the Leon Schiller National Higher School of Film, Television and Theatre in Łódź, Poland. Her path as a photographer began with a Major Project completed under the supervision of Professor Wojciech Prażmowski, in which she used the, largely forgotten now, technique of photo wallpaper. Tarasiewicz is based in Poland and Norway, where she has gained her professional experience on film sets. Tarasiewicz as a documentary photographer is a sensitive observer of her surroundings, who often emphasizes the absurd and marginal aspects of a given situation. Growing up in the industrial reality of the city of Łódź influenced her artistic explorations: for beauty in kitsch, color in grayness, and happiness in people who have bad luck in life. She photographs her subjects in a straight, raw, ascetic way, recording on the film strip the moments which are the symbol of their times and depict their surrounding reality without any sort of embellishment. Photographing people, she lets them play a role of their own design in front of the camera; she doesn’t create psychological portraits, instead encouraging her subjects to develop the situation in harmony with the spirit of the moment. The works from the series New Urban Legends which are on display at the andel’s Hotel in Łódź /curator Lucyna Sosnowska/ have won the portrait category at the 2010 Curator’s Contest of the Photo District News Magazine, the 2012 New Talent Award of the German edition of the FotoMagazine, the 2012 Ars Victoria Book Award of the Photographers’ Network in Germany, as well as the contest of the Norwegian photography website Fotografii.no for a place at the 17#Debutantutstilling 2012 exhibition in Oslo. The New Urban Legends series has been exhibited in, among others, the Milk Gallery NYC (2010), the Art Galerie Siegen (2012), Bølgen & Moi Briskeby Oslo (2012), and the Wypieki Kultury gallery in Warsaw (2013, curator Agnieszka Gniotek). Other photo series by Urszula Tarasiewicz have been shown internationally: in the US at the Critical Mass exhibition (2012), the series The Future Is So Bright created in Norway during the Artist in Residence program at the Halsnøy monastery was presented at a group exhibition in Norway in 2013 and in Warsaw in 2015 at the Ja to Ktoś Inny show /curator Klima Boheńska/, at the Krinzinger Galerie in Vienna during the group exhibition Call Me on Sunday (2014, curator Ursula Maria Probst), at the Jam Factory gallery in Oxford (2014), in Stuttgart at the Face to Face show (2014), at the Bunkier Sztuki gallery in Kraków during the show Kasa z Widokiem /curator Lidia Krawczyk/. In 2015, as one of only two people from Poland, Tarasiewicz was selected for the Third Annual New York Portfolio Review, sponsored by the New York Times Lens blog and the City University of New York’s Graduate School of Journalism.